If you own a Pebble smart watch and are still struggling with ways to use it other than finding out the time of day or seeing who's calling you, Mercedes-Benz has a solution: buy one of their cars. 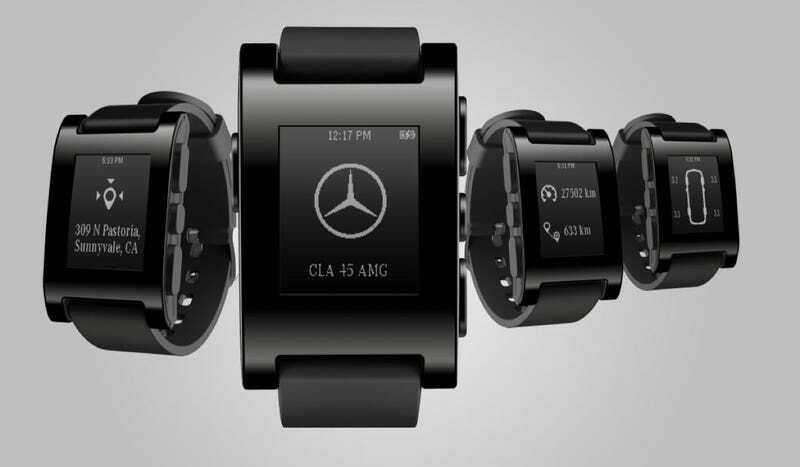 The automaker has struck a deal with the Pebble Technology people to make an app for the watch that controls and monitors a Mercedes car. Because checking stuff like whether your car is locked or due for service on a smart phone was so cumbersome to begin with. The new Digital DriveSyle app will be shown next month at the 2014 Consumer Electronics Show and Mercedes says it works as a "second screen" along with your phone to find out just what's going on with your car. In addition to door-lock status, fuel level and car location status, Mercedes says the Pebble will automatically change when you get into your car so that it can update you of road hazards, traffic information and other things you might be concerned about while you're driving. All on your wrist, which is sort of near the steering wheel you need when you're driving.